COGS held its annual prize giving last Saturday at the Royal Cornwall Yacht Club in Falmouth. Sailors from across the county filled the clubhouse for the evening to be presented with series and individual achievement trophies. In all 31 yachts competed in the offshore and coastal series in 2017. Racers were briefed on planned changes to the racing calendar for 2018, including a new race to Fowey in September, and a new race along the French coast from Roscoff to L’Aber Wrac’h. COGS chair Andrew Laming thanked the organising clubs and the race officers who so generously give their time to run the individual races. He also thanked Ancasta who have become a new sponsor for the new French race and Roscoff weekend which takes place during the early May Bank Holiday weekend. A new trophy was awarded, the Mylor Chandlery for Sailor of the Year, which was presented jointly to Bob Warren and Gilly Fox, owners of Jackdaw for the dedication they had shown during their first year racing this powerful boat. The Penrose Sailmakers Top Yacht trophy was awarded to Nightowler, owned by Mike Lithgo for being the only yacht to compete in every coastal series race. Helford River Sailing Club won the HMS Seahawk Team trophy. 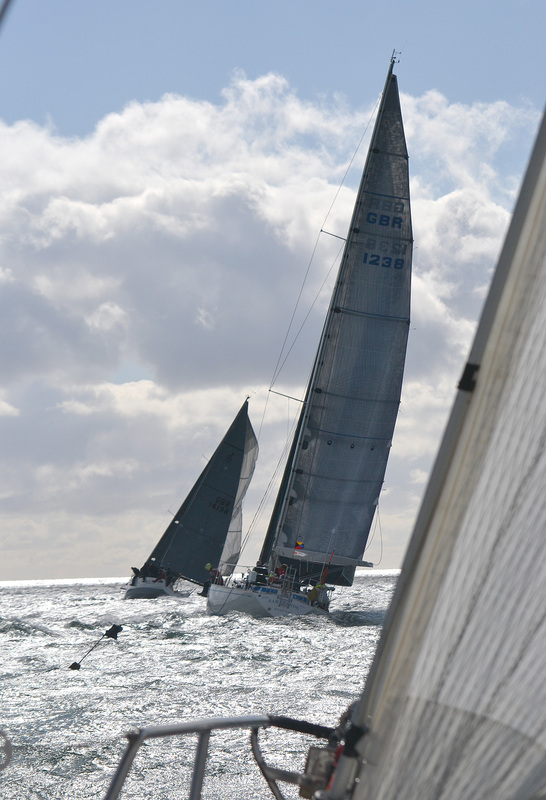 The IRC Offshore Bond Pearce Vase was won by Black Dog. The coastal series in IRC was won by Juno. In Byron class the winner was Nightowler. Ten yachts lined up on the Black Rock start line in Falmouth on Friday for the annual night race to Roscoff. This was the second in the 2017 offshore series organised by the Cornwall Offshore Group COGS, and challenges yachts to a near enough 100 mile channel dash to the welcome of the Bloscon Marina near the historic town on the Brittany coast. Conditions were favourable with westerly winds that varied little between 14 - 16 knots for most of the trip. The sea state was equally kind, and all made rapid progress on close reaches, with the first Pogo 12.5 Jinja, across in just 11 hours and the last across 4 hours later. Most reported fairly quiet shipping lanes and good visibility despite the afternoon having had cloud on the deck on land. The IRC race was won by Stuart Sawyer in his new Black Dog with a 22 minute lead on corrected time on second placed Jinja, with Juno 3rd. Handicap was won by Gawain Bysouth in Celtic Spirit for the second year. A prize giving was held at the marina followed for most by the essential trip to the town’s infamous rum bar. Most boats headed home early on Sunday in even more favourable conditions with the sun shining. The 7th and final race of the Coastal Offshore Group series took place on Saturday in glorious warm sunny conditions and steady breeze. The forecast weak breeze in the early morning filled in throughout the four hours of the race as fifteen yachts completed two courses around marks across Falmouth Bay to the Lizard with roughly half in each class. The Mylor Yacht Club Lay Up Cup sponsored by Marine Team, is an annual event organized by Mylor Yacht Club, with yachts starting from a line from Pendennis Point to Black Rock. Conditions dictate the course, and a forecast of fading light breezes meant the race officer wisely chose a route he could shorten if necessary. Two fleets competing on different handicap systems contested two slightly different courses that allowed for the distance covering abilities of some of the very fast monohulls in the IRC fleet, and to give competitors in some of the slower boats in the handicap fleet a manageable day’s sailing. A great decision by the race officer to shorted the courses at a mark off Gyllyngvase beach brought all yachts home after a pleasant day on the water, by around 2pm. The course differed from the usual COGS races which are normally long distance drag races, in that it was more like a big ‘round the cans’ course with lots of shorter legs. A prize giving took place at Mylor Yacht Club later on Saturday with first place in both classes being taken by yachts from St Mawes Sailing Club. In IRC Pascoes Jaguar, helmed by Craig Brown, had a comfortable win by almost six minutes on corrected time over second placed Black Dog, owned and helmed by Stewart Sawyer. In the handicap fleet Gorra Knack, a GK24 owned and helmed by Steve Rendle also had a convincing win. The two handed trophies were lifted by Juno in IRC and Noon Hi in the handicap class. In the overall season results after seven coastal races sailed, fourth place at Mylor was enough to give Scorpion, helped by Geoff Davies the win in IRC with Afrita second and Juno third. In the handicap fleet, Aura helmed by Euan Beattie was first, Tai Mo Shan second, and Noon Hi third. For full results see below. Mylor Lay Up Cup results, IRC: 1st Pascoes Jaguar, 2nd Black Dog, 3rd Juno, 4th Scorpion, 5th Aftita, 6th General Khaos, 7th Elsa, 8th Jinja. Handicap fleet results: 1st Gorra Knack, 2nd Tai Mo Shan, 3rd Moondance, 4th Nightowler, 5th Celtic Spirit, 6th Noon Hi, 7th Apotheosis. Two handed IRC results: 1st Juno, 2nd Afrita. Two handed handicap results: 1st Noon Hi, 2nd Apotheosis. Friday 13th May saw the start of the second COGS offshore race, a cross channel dash from Falmouth to Roscoff in Brittany, organised by the Royal Cornwall Yacht Club . At a distance of 95 miles and with a forecast of wind from the east this should have been a simple matter of picking the right heading, allowing for the east and west set of the tide, and a bit of sail trimming, but the race turned out to be anything but simple. By a peculiar quirk of the Carrick Roads, the hot day cooled into a beautiful Cornish sunset and a patch of total calm descended on the Falmouth shore exactly where the nine yachts were attempting to start. While Mylor Yacht Club enjoyed great racing at the top of the river, and Royal Cornwall’s fleet sailed past with spinnakers up on the St Mawes side, the COGS boats found they were unable to beat the tide pouring in between Black Rock and the Pendennis shore. Some slowly rotating, and one having to start their engine as they feared being pushed onto the Black Rock reef. It took nearly an hour for all the boats to even cross the start line. The very light wind puffed and died for the next six hours causing three boats to give up and head home. By 1am most of the fleet had barely covered six miles. But then, exactly as predicted in the forecast, at exactly 1.22am, the wind surged in and filled to a superb force 4 - 5, and we were off! The delay meant the normal tricky transit of the busy east and west bound shipping lanes happened in the daylight the following morning, making life much easier for navigators. The first boat to arrive at the finish near the ferry terminal in Roscoff was the lightening quick Pogo 12.5 Jinja at 11.21am with the last of the fleet alongside by 3pm. The local yacht club hosted a prize giving and welcomed the Falmouth boats generously with plenty of wine, hard boiled eggs and even a few oysters. First in IRC was the Sigma 33 Afrita and Celtic Spirit won Handicap class both from from St Mawes Sailing Club. Results after corrected time, IRC: 1st Afrita, 2nd Daring (2 Handed), 3rd Juno, 4th Sarabande, 5th Jinja. The start is at 1030 in the mouth of the Helford River and the finish is off the end of the pier in Penzance harbour (the pier the Scillonian moors along side). There are visitors moorings available in the Helford River (you will be changed the normal visitors rate) and berthing is available in Penzance Dock on Saturday night. The Penzance Dock is open 2 hours before and one hour after high water (1804 - 2104 BST). Food is available on Friday night at the Helford River Sailing Club (booking is advisable) and food will also be available at Penzance Sailing Club on Saturday night (no booking required). More information can be found in the Sailing Instructions.